Franna Crane Hire come’s to the fore for residential lifting, whether you want furniture, gym equipment, office supplies, or large objects like pianos or drum sets lifted onto higher floors. If you need a swimming pool or spa hoisted into the yard, pick-and-carry cranes like our Franna hit the spot every time. Our 20T capacity Franna delivers performance and comfort in one highly manoeuvrable and adaptable unit. With the fuel tank and hydraulic oil set around a potent 6-cylinder turbo-charged powerplant, you’ll get a machine that can run all day under even the most challenging conditions. Regardless of whether you’re looking for a crane hire in Perth for a small residential lift or a commercial hoist, here at Myaree Crane Hire, we’ll send the most effective pick-and-carry crane for your needs depending on the results of any lift assessment. If you have even heavier-duty projects in mind, we can help you there, as well. From the full gamut of construction site materials you want craned up on high through to commercial and industrial lifting projects, Franna Cranes excel across the board. Marine projects like lifting yachts or boats into the water along with all normal maintenance call for a range of cranes and we’ve got your back at Myaree with our diverse, well-maintained fleet. Among all our Franna Cranes, the 20T model is among the most commonly requested. It would be easier to talk about what Franna cranes can’t lift than what they can, so get in touch and we’ll let you know which capacity crane would be the best fit for the lifting project you have in mind. 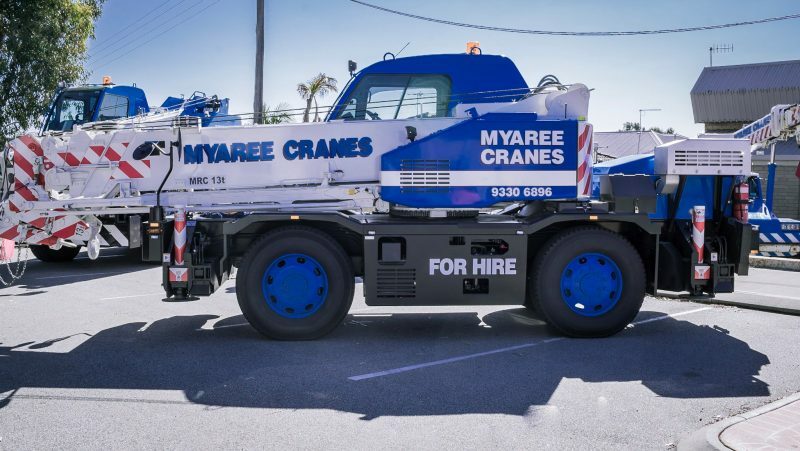 Why Choose Myaree Crane FOR FRANNA CRANE Hire? Perhaps the key reason to choose Myaree Crane Hire, centres on our fleet. Along with our Franna cranes, we also have a range of Perth city cranes, slewing crane hires, and mobile crane hires capable of lifting practically anything you can imagine. We’ve gone as far as hoisting helicopters, plane engines, boats and yachts. Behind the fleet, you’ll be dealing with genuine lifting experts. We started out with a pair of small cranes back in the 1980s and we’ve been turning up every day since to serve the needs of Perth residents far and wide. Commercial, industrial, marine, and residential projects all fall within our skillset, so whatever you need lifting and whatever capacity of crane you need for the job, chances are we can help you out. If you want the upsides of a small family firm without the lack of resources, why compromise? Unlike many crane hire companies in Perth, we can satisfy on both counts. All drivers come with High Risk Work Licences, all work is performed in full compliance with OHSE regulations 1996. Safety is equally important as speed and performance, so once again, Myaree delivers. Get in contact with us today. One of our friendly team members will let you know exactly how we can solve your problem, and then you can let our cranes and drivers do the rest.